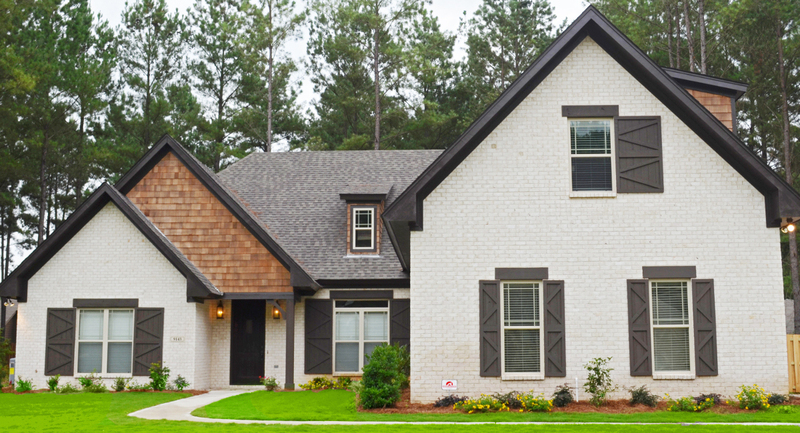 The 2015 Greater Montgomery Home Builders Association All American Home was built by President, Jim Mathews. All products used in the construction process were produced in the United States with as many coming from the state of Alabama as possible. This “One of a Kind” home is located in Woodland Creek Development and includes 5 bedrooms, 3.5 bathrooms and 3,354 square feet. The home features vaulted ceilings with cedar beams in the great room and eight foot invisible wall sliding doors lead from the great room to a vaulted screen porch. The screen porch features a fireplace with a cedar mantel and a flat screen TV. This energy efficient home has two-18 SEER heat pumps, a tankless water heater, as well as an electric vehicle charging station. The home qualified as an Alabama Power Superior Solutions Platinum Home, which is the highest level offered. The kitchen includes marble counter tops, custom cabinetry, a work island, and stainless steel appliances. The master suite has individual vanities, his/her walk in closets, a luxurious soaking tub and a large separate shower that has entries from two sides as well as dual shower heads and a long tiled bench. The upstairs 5th bedroom could be used as a media room. This home was also equipped with a storm safe room constructed with Alabama made components provided by Storm Resistant Systems and The University of Alabama Birmingham.